Transfers from Palma to Palma Nova, Try not to confuse Palma Nova (or Palmanova) with the capital of Mallorca, which is called Palma de Mallorca. This place is located in Calviá municipality is a bath place which has a very wide bay and three beautiful beaches: These are Son Maties, Na Nadala and Carregador, as well as the small Son Caliu. Palma Nova is not as luxurious and expensive as the near Puerto Portals, and it is much more accessible financially speaking than many zones in Mallorca either in vocational rentals or property purchases. Palma Nova was developed during the 60s in the 20th century as complex touristic destination. It has a very huge international community, but attracts British residents and tourists mostly. The difference between Palmanova and its very famous Magaluf is that this place has a vivid life during the whole year. That is why is a very popular option for people that live there permanently. You can get to Palmanova in just 10-15 minutes and apart from that, there are all kinds of leisure and medical services. Transfers Palma airport to Palma Nova, shopping in Palmanova. Despite being a very small place, it has a huge variety of stores: souvenirs with beach articles, real estate companies, book stores, perfumeries and leather goods stores. There are also nearby and close supermarkets. You can also find a few minutes away the Port Pi Shopping Mall. But, if you want to go shopping, we highly recommend you go to Palma de Mallorca where you can find everything you are looking for. Activities in Palmanova. Palma Nova is a place to relax and enjoy of a great vacation on the beach, but Palmanova can be also an ideal place to explore natural parks and golf courses of the islands. You will find Santa Ponsa and Vinyes Creek golf camps. The Tramuntana Mountain Range, located also on the southwest of Mallorca attracts trekkers, excursionists and cyclers, mainly during the coldest months. We encourage you to stay in Palmanova in winter to explore the rest of the island or spend a day in the capital, Palma de Mallorca. Transportation in Palmanova. To go any place, you want in Palma Nova, the best option is using the public bus service inside the zone which is very safe and comfortable, and hence there will be not inconvenience for you to enjoy the stunning view in Palmanova. Another option is a car rental. For less than €50 per month, you can rent a car and go anywhere without any shocking time. Any choice you make, Palmanova is one of the most exciting place to visit. You will never get bored! Pack your luggage and have a nice trip! Palmanova Lodge. Since Palmanova is a well-developed touristic complex that suits everybody needs. As usual in all the island, the offering of rooms and places to stay in Palmanova is very diverse. From 5-star hotels with great suites and single rooms if your plan is to enjoy all the facilities inside the hotel, and not going out so much, to very cozy and comfortable inns in which you can enjoy the view of the cliffs, the white sand, and a brilliant night on the sky. Palmanova can adapt to your personal budget, and yet you can enjoy everything this great destination has to offer to you. No matter what you want to do there, Palmanova counts with excellent lodge places to stay and have the holidays of your dreams. Do not lose the opportunity to book your room, or to rent an apartment to start the adventure. Palmanova Surroundings. 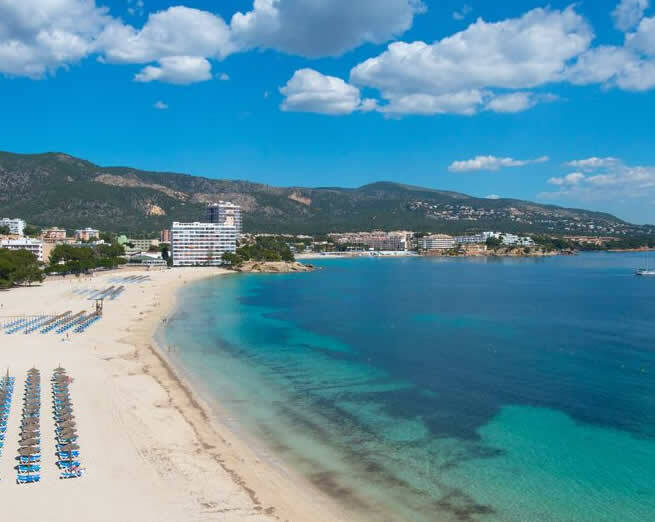 For those who are looking something beyond having fun, the capital of party, Magaluf is just some minutes away from Palmanova, to the other side of Punta de Sa Porrassa, where there is a lighthouse from XVII century. In Magaluf you will find attractions such as House of Katmandu, Pirates, Western Park, Aqualand and Karting Magaluf. Santa Ponsa is a familiar place that is located just a few minutes if you take a taxi and Son Caliu you will find many supermarkets. 6 kilometers away from Palma Nova is Calviá. We recommend you to go to Calviá to know the countryside of the island and enjoy some booze in one of its bars. CTM offers a bus service that goes from Palma, passing through Palma Nova until get to Calviá many times a day. Palma Nova Airport Transfers. There are different ways to make your transfers from Palma airport to Palma Nova. One of those ways is taking the public bus services in the Palma de Mallorca airport. There is a route that has several buses that go to Palmanova and back each hour. In that sense, you will do your transfers from Palma to Palma Nova with no difficulty. Other options are if you travel with a big group of people, you can hire a shuttle and pay approximately € 20 each to leave you exactly in the place you will stay in Palma Nova. The transfers Palma airport to Palma Nova is easy to do. The other option to make your Palma Nova transfers is by renting a car in advance before your arrival, or even at the airport if you want to travel with certain comfort and not relying on other people’s time and schedule. The Palma Nova airport transfers can be the beginning of a great adventure! Finally, the other options are the taxi services inside the Palma airport to Palmanova and pay around €30 for this service. These are the options you have to make your transfers with no difficulty at all.